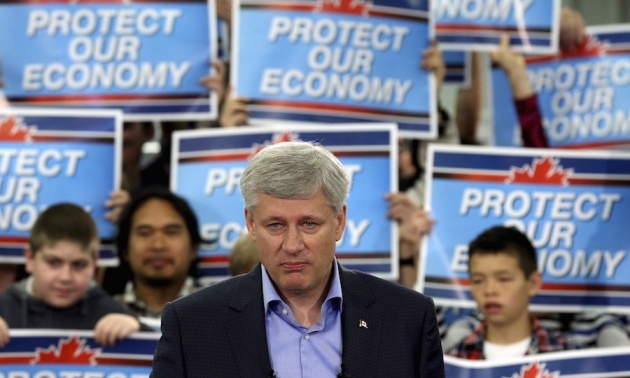 Prime Minister Stephen Harper's government has cut funding and limited researchers' influence over policy. Stephen Harper has been Canada's prime minister since 2006. Canadians will head to the polls on 19 October, in a federal election that many scientists hope will mark a turning point after years of declining research budgets and allegations of government censorship. Prime Minister Stephen Harper, in office since 2006, now finds his right-leaning Conservative party in a tight, three-way race with the left-leaning New Democratic Party (NDP) and the middle-left Liberals. Although science has not emerged as a top issue during the campaign, researchers are fighting to make their concerns heard. The group estimates that the Harper administration has eliminated jobs for some 2,500 scientists. And the government’s own data show that Canada’s spending on scientific research and development dropped from sixteenth among 41 comparable nations in 2006 to twenty-third in 2011 (the most recent year for which government figures are available). Harper has also been accused of limiting government scientists’ ability to communicate with the press and public; Canada’s information commissionerpromised to investigate in 2013, but has not yet released any findings. “The Harper government has had complete disdain for federal government science,” says Peter Wells, a marine biologist at Dalhousie University in Halifax, Nova Scotia. While the Conservative party has done little to address such critiques, members of the two opposition parties have advocated a stronger role for science in government. Dozens of NDP and Liberal candidates for parliament have declared their support for evidence-based decision making by signing a “science pledge” developed by Evidence for Democracy, a non-profit science-advocacy group in Ottawa. Science advocates see little chance that their issues will be aired during a 17 September debate in Calgary that will pit Harper against NDP leader Thomas Mulcair and Liberal leader Justin Trudeau. But concerns about the state of Canadian science have nevertheless influenced party platforms. In contrast, Harper's government phased out the position of national science adviser in 2007–2008, replacing it with the Science, Technology and Innovation Council (STIC) — a body that has drawn criticism from scientists for operating behind closed doors. STIC reviews issues at the request of the federal government, and many of its reports are confidential. “It doesn't even have many scientists on it,” says Graham Bell, a biologist at McGill University in Montreal and president of the Royal Society of Canada, who would like to see the science-adviser post re-established.